About 700 LC students contributed 69,170 hours of community service in 2012-13 to earn University of Lynchburg a place on the President’s Higher Education Community Service Honor Roll for 2014. Lynchburg was recognized in the general community service category for three project areas. 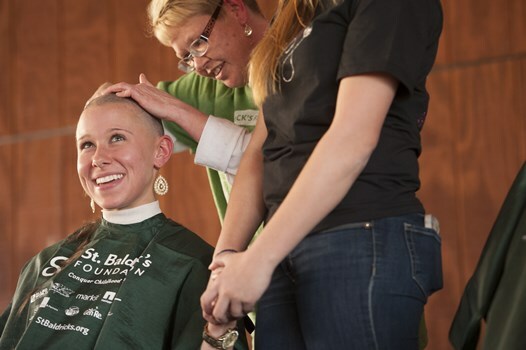 First, the LC community raised more than $61,000 for cancer organizations including St. Baldrick’s Foundation, the American Cancer Society and St. Jude Children’s Research Hospital. Secondly, the Center for Economic Education promotes economic literacy throughout Central Virginia and provided 20 workshops to area educators and held the Regional Market Day for fourth-graders who create their own businesses. Finally, LC held a weeklong event called “Break the Chains” to highlight the global and national human trafficking that keeps 27 million people trapped in modern-day slavery. The total service hours represent a wide variety of efforts. University of Lynchburg Emergency Medical Service (LCEMS) contributed the lion’s share with 28,080 hours of community service. LCEMS has more than 25 members and is a Virginia state-certified emergency health care service that provides Basic Life Support to those on College property. The Bonner Leaders contributed 11,316 hours working with the community on issues including education, hunger and homelessness, environment and youth development. Ten Greek organizations donated 11,316 hours of volunteer work. LC was also on the honor roll in 2006, 2008, 2009, and 2010, 2012 and 2013. Nationwide in 2012, 3.1 million college students dedicated more than 118 million hours of service valued at more than $2.5 billion.